The world-famous library of Matthias Corvinus (Mátyás Hunyadi), King of Hungary (1443–1490, reigned: 1458–1490), the first royal library outside Italy and north of the Alps. As for its size, only estimates can be made; it probably included approximately 2,000 volumes. It was the second greatest collection of its era, the first being the Vatican Library. The collection was founded in the second half of the 15th century in the palace of the King of Hungary. As a reflection of Humanist principles and a representation for a Renaissance ruler, it did have its predecessors and a preparatory phase. The proximity of Italy had played a key role in the development of Hungarian culture, since the establishment of the Hungarian state, and this role intensified when, in the early 14th century, members of the House of Anjou succeeded to the Hungarian throne. 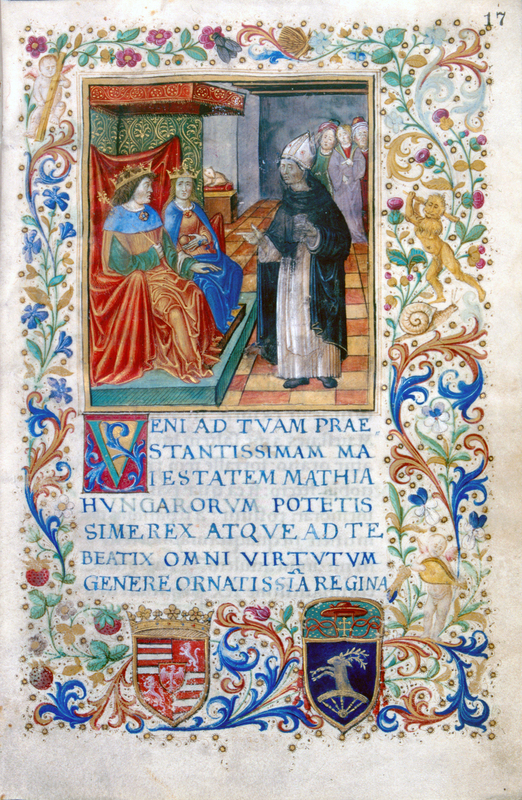 King Matthias’ Bibliotheca Corvina is a product of the centuries-long intellectual influence of Italy, the culmination of a process whose last phase was when Beatrice of Naples (Beatrice d’Aragona) and, with her, the Italian court arrived in Hungary in 1476. As for the immediate predecessors in Hungary, Iohannes Vitéz’s library and intellectual influence need to be noted. Iohannes Vitéz (c. 1408–1472) was born in a Slavonian family. His education, most probably, had been affected from the very beginnings by the proximity of Italy-influenced Dalmatia. In the chancery of King Sigismund, he had the opportunity to gain direct experience of Italian chancery humanism, and was most probably influenced by learned Italians, above all, by the excellent Italian humanist Pier Paolo Vergerio (c. 1369–1444). Iohannes Vitéz was a close acquaintance of Aeneas Sylvius Piccolomini (1405–1464), who, at the time, was residing in the Viennese court of Frederick III (1415–1493). Vitéz, a loyal follower of the Hunyadi family, had a distinguished career: he became the Bishop of Várad (today Oradea) and then the Archbishop of Esztergom. He had great influence and was an example for Hungary’s cultural elite. His famous library was a true humanist collection. Vitéz had been active as a humanist philologist until his death. The immediate Hungarian predecessor of Bibliotheca Corvina was, most probably, Iohannes Vitéz’s library, both as an example to follow and as a physical predecessor. 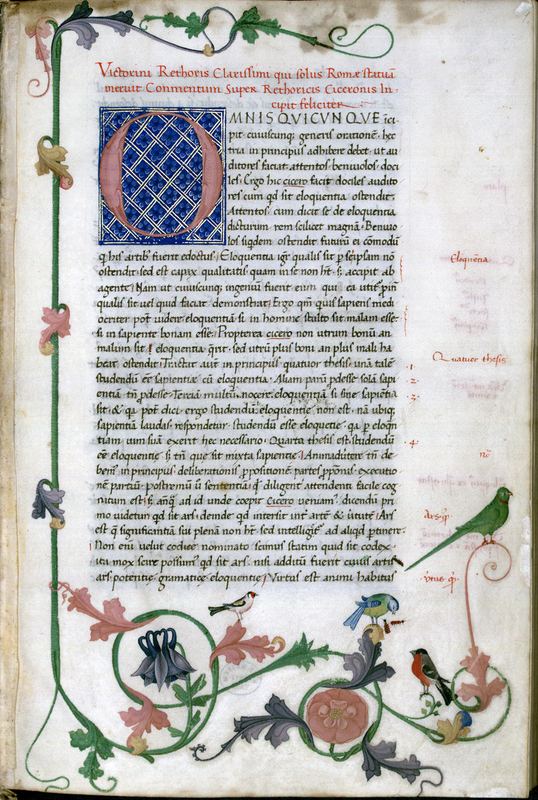 As shown by recent research, the earliest sections or the core of the Bibliotheca Corvina collection was made up by manuscripts originating from Vitéz’s library or environment. However, a basic difference between Iohannes Vitéz’s and King Matthias’ libraries was that while both were based on humanistic principles, the composition and the ornate nature of the latter was strongly determined by its function to represent royal authority. 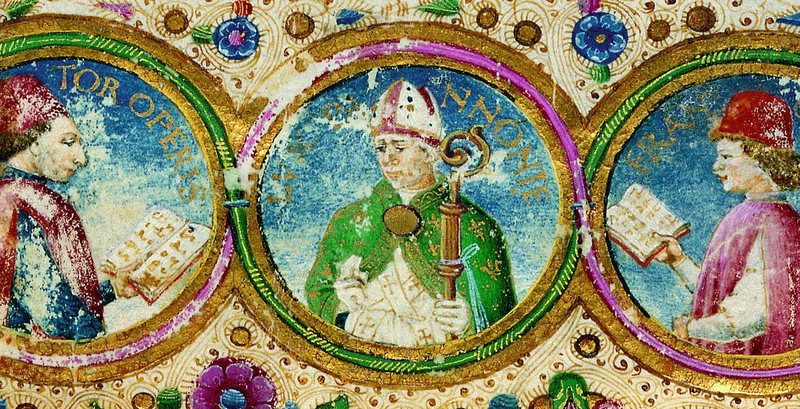 In addition to Ihohannes Vitéz’s manuscripts and the copies made in his vicinity, part of the codices belonging to two other highly educated men, Bishop of Pécs Ianus Pannonius and Archbishop of Kalocsa György Handó, who had played a key role in King Matthias’ royal administration, had also been included in the collection of the Royal Library. György Handó’s library, known so far only from sources, has recently been identified and explored by Dániel Pócs. 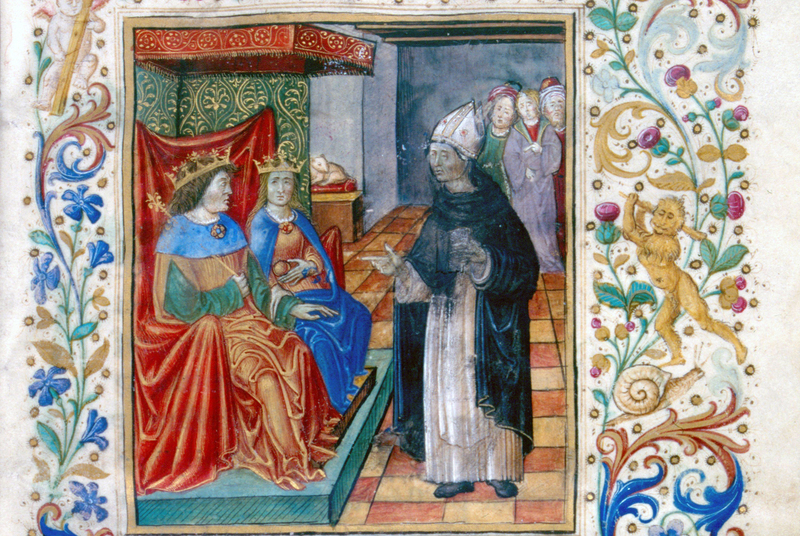 Undoubtedly, Beatrice’s arrival was of critical importance as regards the foundation of the royal library. The erudite Italians residing in the court, such as Taddeo Ugoleto (1448–1513 c.) or Francesco Bandini may have inspired the king to establish a library that represented his authority. For this reason, a book workshop was set up in Buda Castle; as shown by evidence, it had already been in operation around 1480. 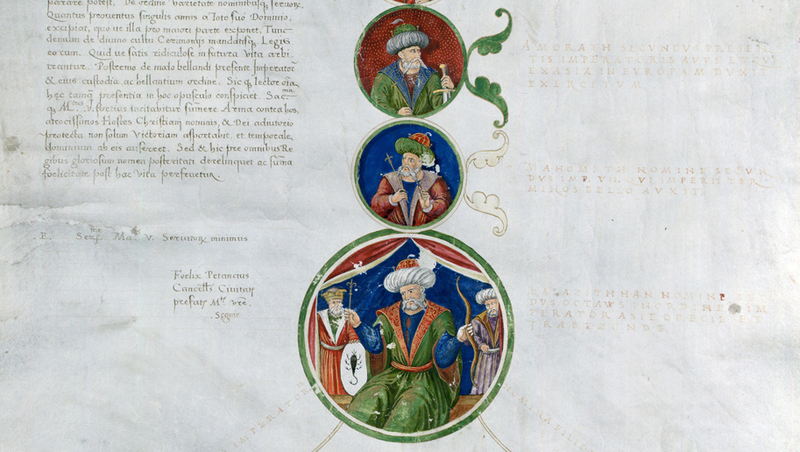 Dated grants of arms provide evidence that Francesco Castello, the Milanese manuscript illuminator had been working in Buda at that time. The powerful effect of his style is perceptible all along the codices made in the Buda workshop. It seems that the idea of a conscious and systematic development of the royal library came to the foreground when, after the conquest of Vienna (1485) and Wiener Neustadt (1487), the Hungarian royal court resided mainly in Vienna, in a period of relative peace. 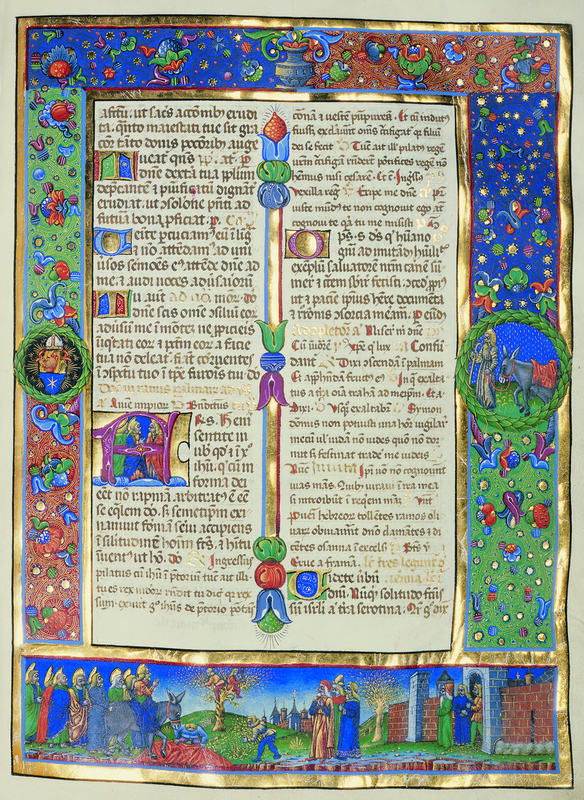 The royal librarian and educator, Taddeo Ugoleto from Parma travelled to Florence in 1488 to organize the conscious extension of the Hungarian royal library with volumes from Italy. 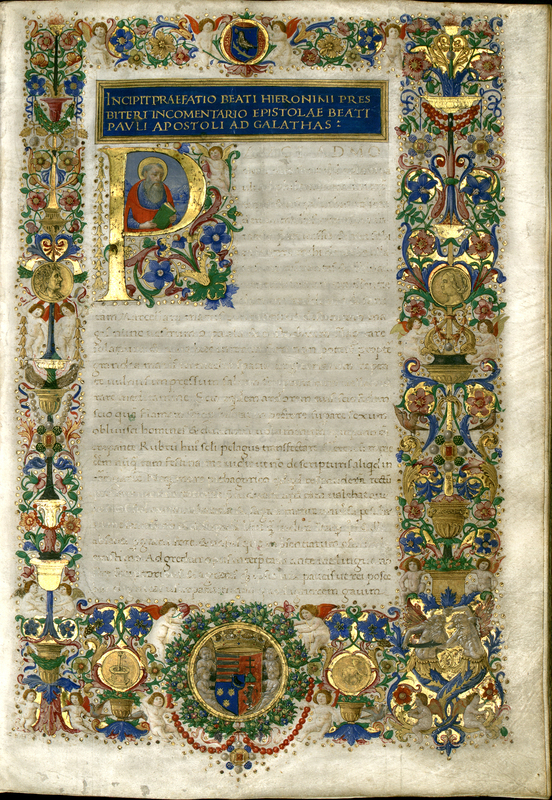 In Florence, he started to cooperate with the poet Naldo Naldi (1436–1513), who, beside supervising the process of copying codices for Matthias, wrote the epic poem De laudibus Augustae Bibliothecae in laudation of the evolving royal library. 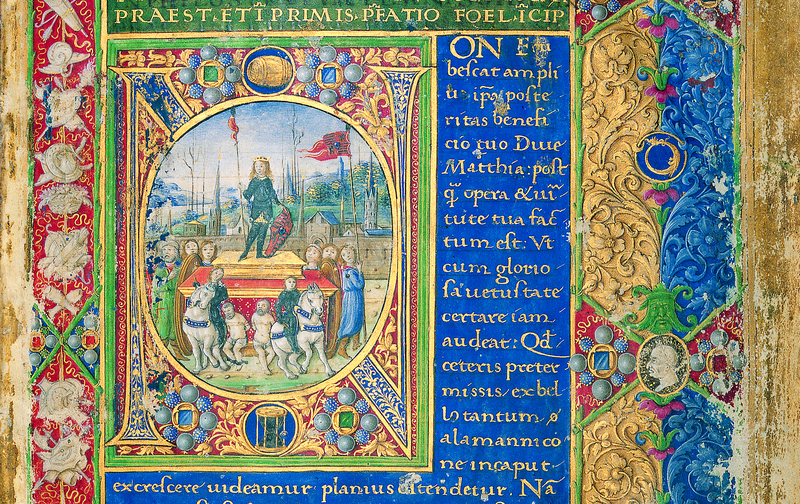 Bartolomeo della Fonte (1446–1513), another significant figure of humanism in Florence, visited Buda in that period; Matthias commissioned him with the development of the library. 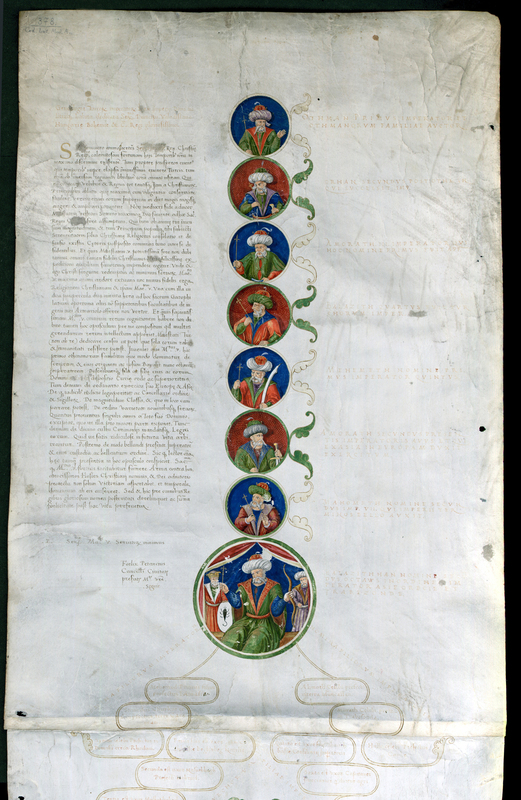 It was then that excellent scribes and illuminators worked for King Matthias, such as Attavante degli Attavanti, Boccardino il Vecchio, Gherardo and Monte di Giovanni, to name but the most famous ones. 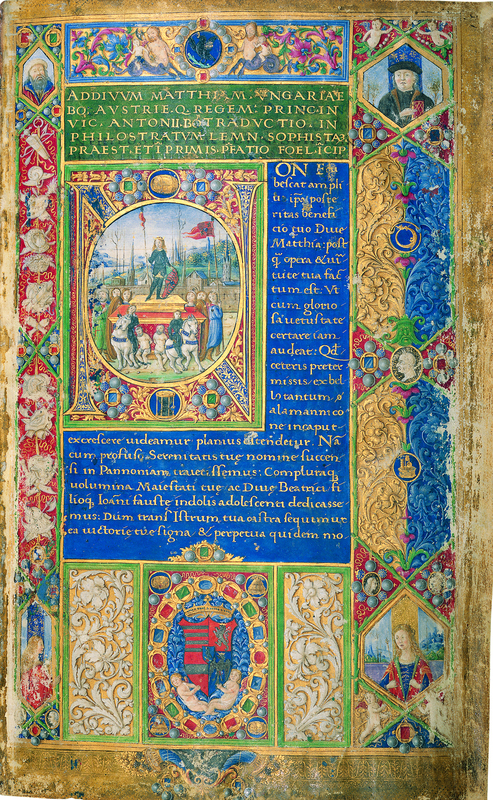 This process – and the role of the royal library as a form of the representation of the Hungarian king – are best reflected by the double frontispiece of the Philostratus Corvina (Budapest, NSZL, OSZK Cod. Lat. 417.). 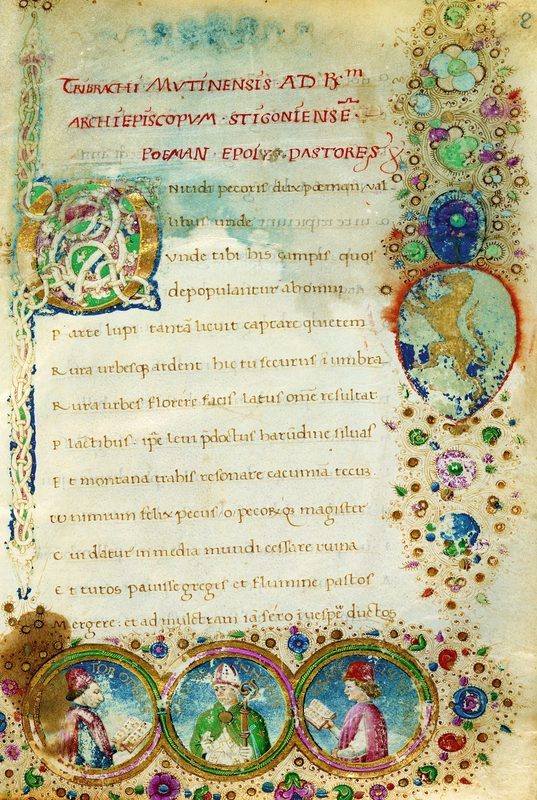 The codex was translated from Greek to Latin by court historian Antonio Bonfini. Its Praefatio describes the conquest of Wiener Neustadt. The frontispieces show Matthias as a successor of Roman emperors who had been equipped not only with the virtue of fortitudo (bravery) but also with prudentia (wisdom) and were friends of culture. The initial depicts Matthias’ heir, John Corvinus in a chariot, to commemorate the triumphal procession after the victory at Wiener Neustadt. 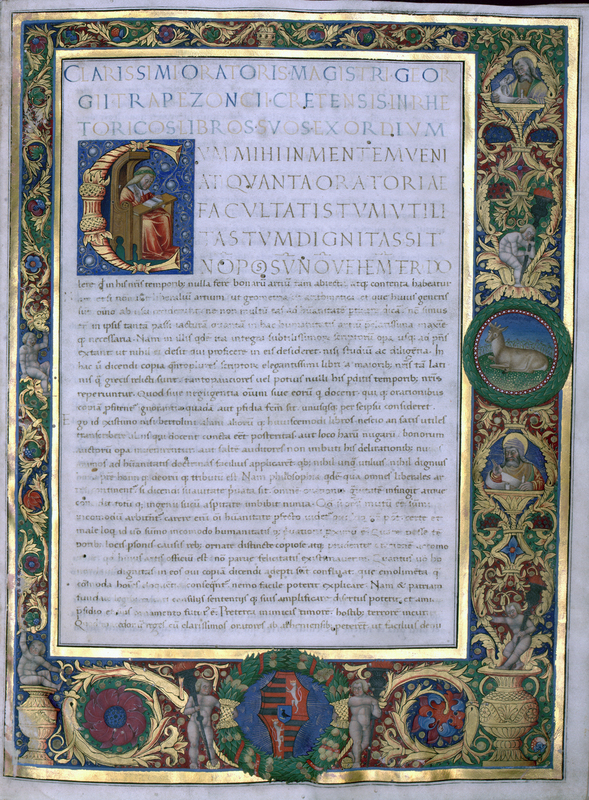 Beside Naldi’s work, the frontispiece of the codex is the only one that names the royal library, referring to it as “Bibliotheca Corvina.” The fact that the establishment of the library was a conscious act is reflected by the ornate structure of the library hall and the unified appearance of the volumes. As evidenced by Naldo Naldi’s account, the library hall, located on the Danube side of the Buda Castle, near the royal chapel and the throne hall, had been furnished with bookcases with inlaid decoration. The open shelves had been protected against dust with heavy red curtains; the double windows had been fitted with stained glass. 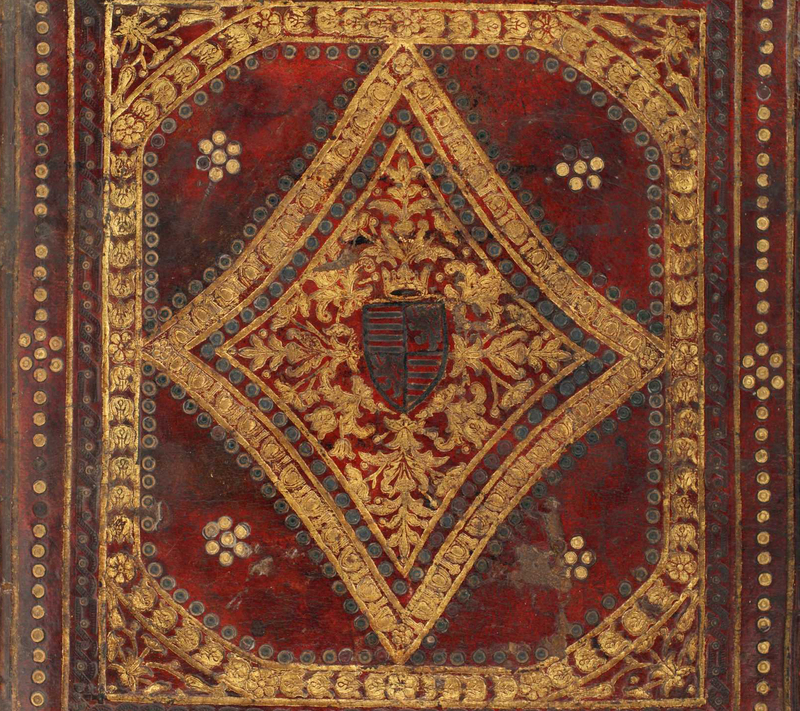 The bookbinder master, who, most probably, came from Italy, worked out a unique binding design for the codices: a composition consisting of Italian all’antica and Oriental (mainly Persian) motifs, with the royal coat-of-arms pressed in the center. This type of binding marked the beginning of a new chapter in the history of European bookbinding. 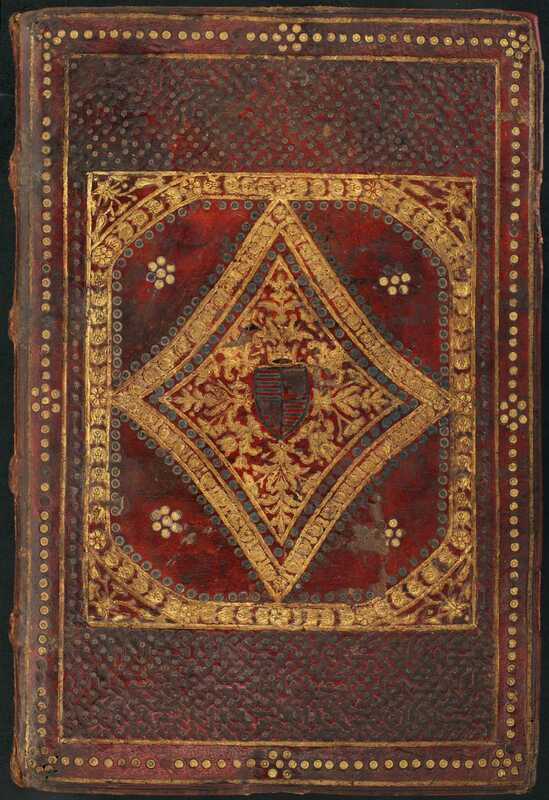 Some volumes were bound in purple, red or blue velvet, or in red or blue silk. 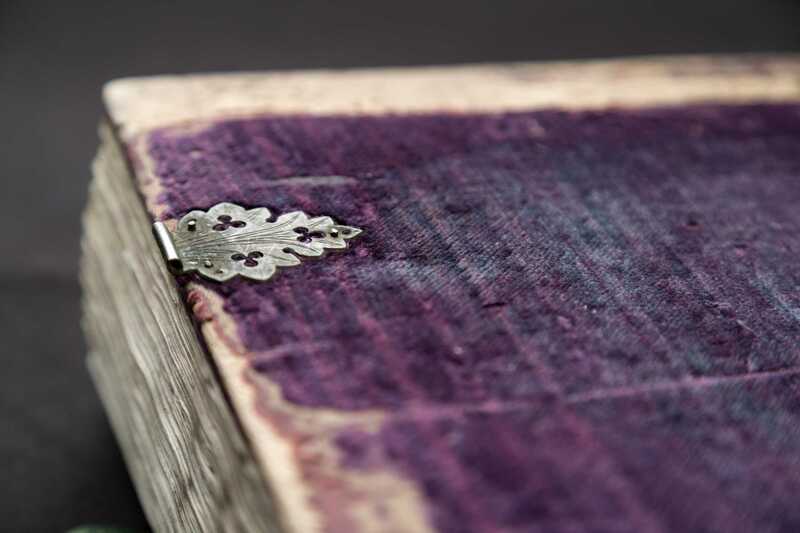 Purple velvet binding with leaf-shaped copper clasps was the characteristic binding type of corvinas that had been bound in Buda. Budapest, NSZL, OSZK Cod. Lat. 241. 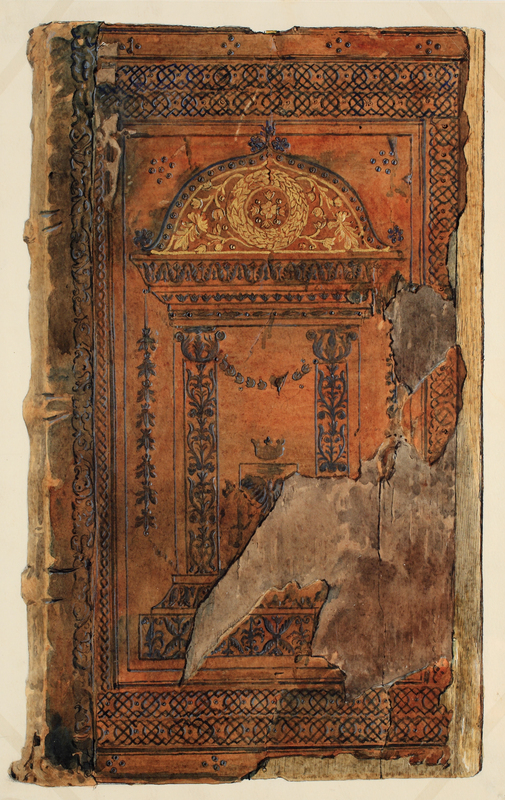 The leather-bound codices were fitted with leaf-shaped copper clasps, while the textile-bound volumes were sometimes decorated with enamel-inlaid gilded silver clasps. 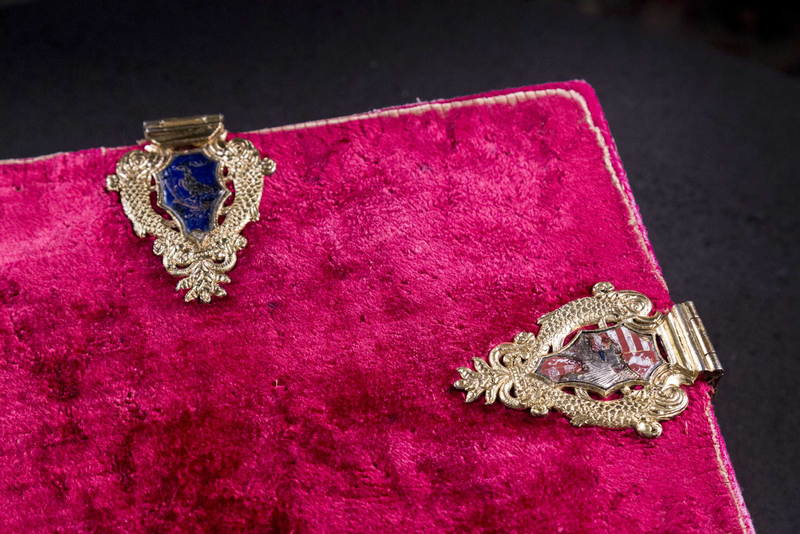 Velvet bindings made in Buda occasionally featured gilded silver clasps, decorated with enamel inlay, just like in the case of Augustinus corvina. Budapest, NSZL, OSZK Cod. Lat. 121. The edges were decorated with gilding, repoussé or special painting techniques. The volumes rested on the shelves with their front cover down, so that those entering the library hall could enjoy not only an intellectual experience but also aesthetic beauty. For representation purposes, the royal coat-of-arms had been painted on the frontispiece in Buda. This representative royal library of a unified appearance, established at the end of the 1480s with a conscious effort, and referred to with a specific name is called now Bibliotheca Corvina and has been preserved by European memory. 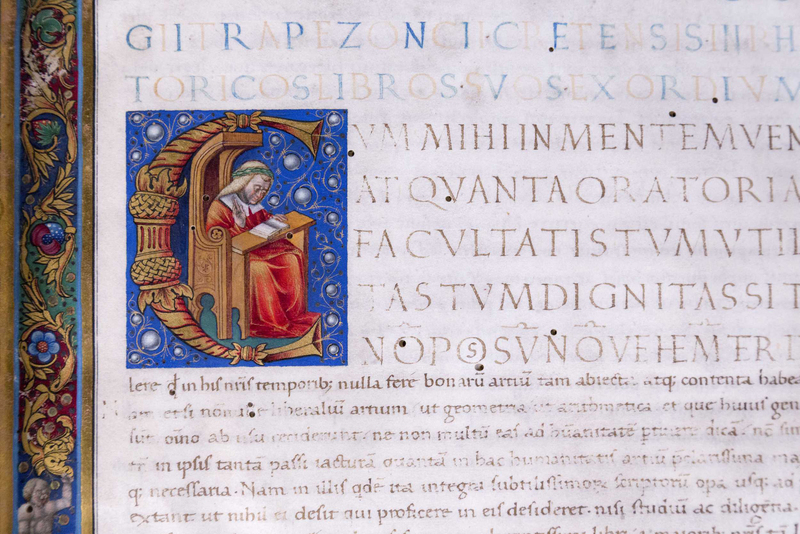 The Bibliotheca Corvina includes the works of classical authors and those of the Church Fathers, as well as contemporary works dedicated to King Matthias. In the latter category, the volumes written by Johannes de Thuroczy and Pietro Ransano on Hungary’s history are of special significance. A unique feature of the library was that it contained not only Latin works, but Greek volumes as well. 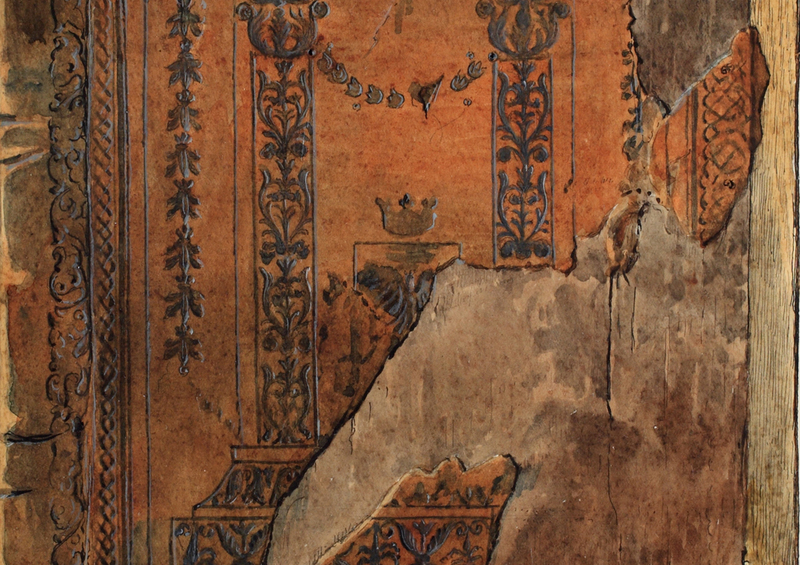 De caeremoniis by the Byzantine Emperor Constantine Porphyrogennetos (905–959) was preserved only in the Bibliotheca Corvina. There are hardly any printed volumes among the corvinas, most probably because hand-written and heavily ornamented manuscripts were thought to be the proper tools for the representation of royal authority. Nevertheless, Johannes de Thuroczy’s chronicle, referred to above, made its way to Bibliotheca Corvina in the form of a printed volume. After King Matthias’ death, the development of the library came to a halt, yet the collection remained a treasure of the palace. Kings proudly showed their guests around the library hall and gave away some volumes as presents. The collection was destroyed during the Ottoman invasion, most probably, after the Battle of Mohács (1526). Surviving volumes were taken to Istanbul as part of the loot. 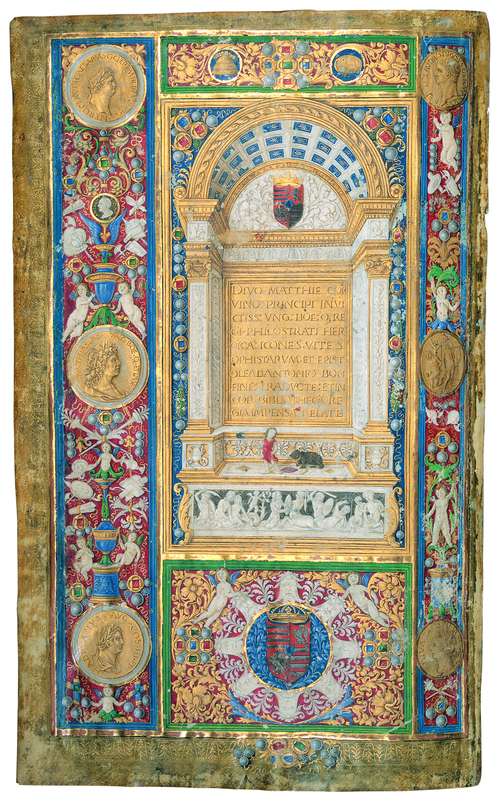 The surviving volumes are mainly those that were transported to Western Europe before 1526. Scholars of the Early Modern Period maintained the memory of Bibliotheca Corvina. Johann Alexander Brassicanus (1500–1539), the humanist scholar based in Vienna, wrote an account of his visit to Buda in 1525, which was a crucial record. Hungarians also remembered. In those historical times when Matthias Corvinus’ memory came to the limelight, such as in the age of Gabriel Bethlen (1580–1629), Prince of Transylvania and Péter Pázmány (1570–1637), Archbishop of Esztergom, efforts had been made to regain the remnants of the collection (thought to be located in Buda Castle) from the Ottomans. However, it was centuries later that the few volumes still kept in the Topkapı Palace were returned to Hungary: Ottoman sultans donated them to Hungary in 1869 and 1877. Only a few corvinas remained in the territory of Hungary. In addition to Turkish donation, it was the Venice Agreement (concluded in 1933 after the breakup of Austria-Hungary) that resulted in a significant expansion of the collection of National Széchényi Library. The memory of Bibliotheca Corvina has been maintained, primarily via exhibitions and scientific research based in National Széchényi Library. 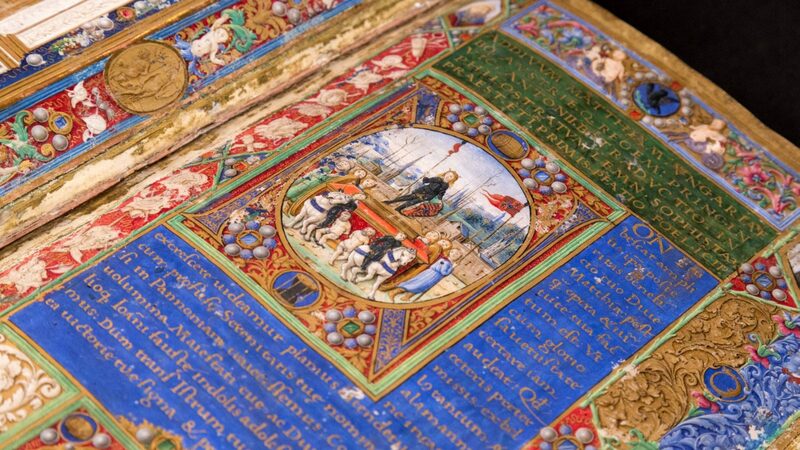 As part of the program entitled Bibliotheca Corvina Virtualis, a dedicated corvina website has been launched to offer a platform where the surviving items of the famous collection are reunited, even if only virtually. Bibliotheca Corvina was recommended for inclusion in UNESCO’s Memory of the World Register in 2005.